Health problems caused Gretchen Wood to struggle with her weight. But with weight loss surgery, hard work and a mental shift, she was able to overcome it. Gretchen Wood learned that surgery alone isn’t enough to guarantee lasting weight loss — making lifestyle changes are key. Gretchen Wood started her life battling health problems. She was born with underdeveloped kidneys, and her doctors told her parents she might not survive. If she did, she would eventually need a kidney transplant. At age 13, her health problems worsened — she was diagnosed with type 1 diabetes. “I became really angry with God. Why would he choose this for me?” she says. In early adulthood she started to gain weight. “I wasn’t exercising. I wasn’t eating right. I was being 20,” she says. In 2003 she noticed a worrisome symptom — her thighs felt like they were burning. She mentioned it to a friend who was a dialysis nurse and her friend started to tear up. She recognized it as a sign that Wood’s kidneys were failing. “I thought, ‘well at least I made it to age 37’,” Wood says. She needed dialysis, three times a week for four hours at a time. She centered her life around it, doing her errands, laundry and housework the day after, when she had enough energy. “The day before dialysis and the day of I was just wiped out,” she says. “At this point in my life I turned back to God. I put my full faith and trust in him. I knew I would either live by a machine for years to come or he would take me when it was time. I was at peace with either,” she says. After three months of dialysis, Wood got an amazing gift — a kidney transplant. Secretly, her brother had gone through the process of finding out if he could donate a kidney. “He didn’t tell me anything because if he was not a match he didn’t want me to be disappointed. I was just in tears. I was hugely thankful and overwhelmed. It was the greatest gift he could give me,” she says. But depression — a potential side effect of the antirejection medications she had to take — struck again. And the drugs can also contribute to weight gain. Over the course of 12 years Wood’s weight climbed up to 298 pounds. “I gave up on the idea that I would ever be a size 10 again. I would look at myself and cry. I didn’t like the way I looked. I was uncomfortable and embarrassed. I thought, ‘Well, this is the path God created for me. I’m going to be a fat girl’,” she says. Wood researched weight-loss surgery and decided that the sleeve procedure — where your stomach is surgically reduced to a smaller size — was the right choice for her. “I had tried most everything else, but I always gained the weight back. This is a much more permanent method. It forces me to eat less,” she says. But surgery alone isn’t enough to guarantee lasting weight loss. Lifestyle changes are key as well. 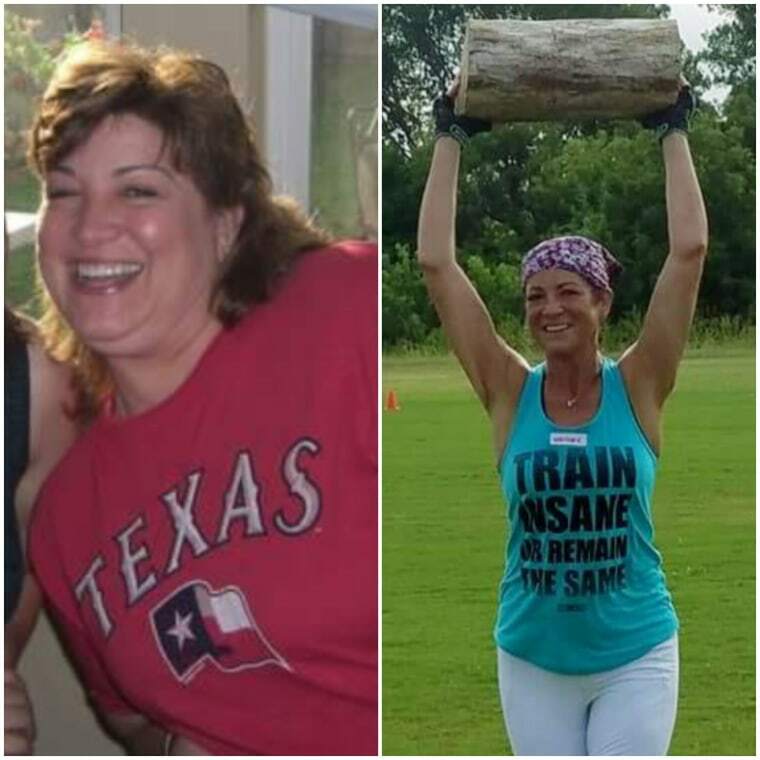 Following the instructions of her weight-loss team at Baylor Scott & White Medical Center – Grapevine, she started working out with a personal trainer so she would be strong and healthy for the surgery. In December 2016, when she had the surgery, she was down to 272 pounds. After the surgery, she says it felt strange at first to eat such small amounts. She was taking tiny sips of liquid that amounted to just two tablespoons. But as she healed everything became easier. Wood now weighs 150 pounds and wears that size 10 she thought she would never fit into again. “My surgeon’s goal weight for me was 180, but that wasn’t good enough for me,” she says. Importantly, she no longer turns to food for comfort. “Most of it really is in my mind. I changed my attitude about food and changed my attitude about how I want to live. I take my dog for a walk, or take a nap, or watch a funny movie on TV or spend time with God,” she says. She can easily list ways the weight loss has changed her life. With type 1 diabetes, she still needs insulin to control her blood sugar, but she’s cut her dose in half. She can do pushups. She can fit through a turnstile with ease. She can clean a house in one-third less time without being exhausted. She can buy whatever car she wants, without making sure she can fit. Inspired by her success, her husband had weight-loss surgery as well. “He’s doing really well, and I love celebrating the small victories with him,” she says. Breakfast: Usually a protein shake. Lunch: A green salad topped with chicken, fish, ground beef or ground turkey. Dinner: Yogurt with fruit and nuts and another protein shake. Snacks: Small portions of cheese sticks, cottage cheese, yogurt or, occasionally, ice cream. “It sounds like I eat like a rabbit, but I’m fine with it,” she says.